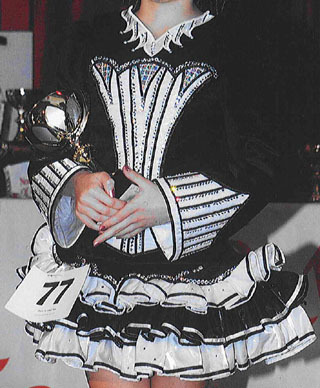 Beautiful black and white velvet dress made by Loretta Mauriello – very similar to the dress worn by Loretta’s daugher Simona in the JIG VIDEO. The dress has a white panel at the bodice and black and white cuffs. The skirt is dropped waist, with 3 tiers of black and white organza/tulle with matching piping. This would suit a 10-11 year old, although my daughter is 13, but very petite. The dress has been altered at the back in order to give a little more room over the hips, but this is not noticeable as it is covered by the back panel. The dress is covered in more than 1500 Swarovski Crystals, and is fully lined. The collar is white with a band of crystals. The dress comes complete with black bloomers, crystal tiara and back crystal panel. The dress is clean and from smoke and pet free home. The skirt is 3-tiered but there is an option to add another tier to make the dress longer if required. Asking Price: £460. Shipping costs are not included in the asking price. Sale is final.